Say you're at the mall and you see a product that really grabs your attention. But there's not much information about it, and you're wondering if you can buy it for less elsewhere. Turn on your iPhone, snap a picture of the bar code, and here comes everything you ever wanted to know about the product. Deep Prose Cyclops 1.0 for iPhone 3Gs is a free barcode scanner that uses the built-in camera of the iPhone 3Gs to scan barcodes on items. Item information is retrieved from Amazon and presented with a convenient link to the product page. Simply click the scan button, take a picture of the barcode, and Cyclops does the rest, scanning, searching and presenting the item details right away, including new and used prices. Once the picture is taken, Cyclops analyzes the image in real-time on the iPhone. 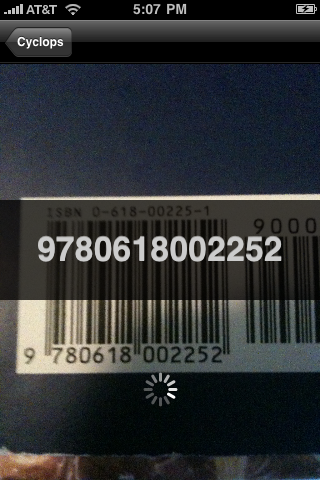 When the barcode is read, an online search retrieves information such as title, image, publisher, studio, tracks, dewey decimal number, prices, and more from Amazon US, UK, FR, DE, CA or JP. Both UPC and EAN barcodes are supported. Scanning history is stored for quick reference and items can be easily reordered and removed. If an internet connection is not available when scanning, the online search can be done later on when the network is accessible. Cyclops requires the camera on the new iPhone 3Gs to work, older iPhone versions are not supported at this time. Version 1.0 is the initial release and is available for free on the App Store.